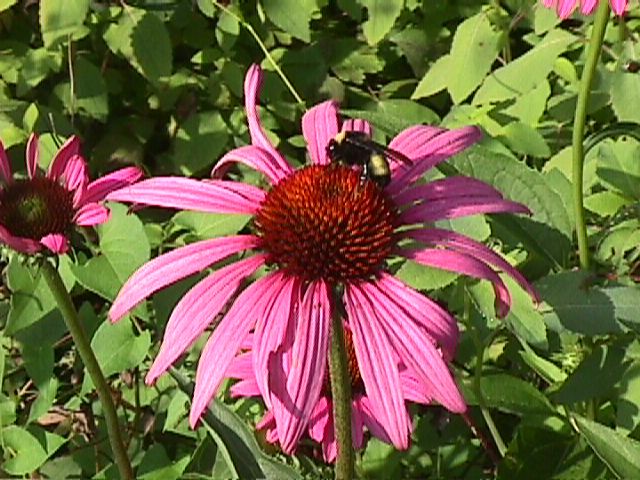 At the core of environmentally friendly landscapes is the use of native plants. Native plants are those species that were present locally when the first settlers arrived. These plants have evolved over thousands of years to be able to live on rainwater alone, without adding fertilizer, and their deep roots help infiltrate rain where it falls and carry the moisture deep into the ground to replenish our aquifers, cleaning it as it goes. As you start this year's yard work and lawn care and are dreading the thought of mowing grass and applying fertilizer and weed killer, take a step back and think of the native possibilities. There are countless ways to incorporate native vegetation into your home landscape. Start one plant at a time--or create a whole new flower bed. Native prairie and woodland plants evolved in this climate and can handle the cold deep freeze, the spring rains and the hot drought conditions that we experience here in northern Illinois. 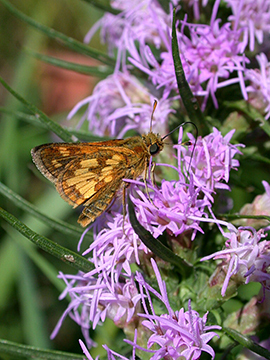 Once they are established, generally after the first growing season, native plants thrive on their own and do especially well during drought conditions. They rarely need to be watered and do not require any fertilizer. Their deep roots hold the soil, allow water to filter down deep into the ground where it belongs, and because they "evolved" here, they attract dozens of species of beneficial wildlife like butterflies and songbirds. Having native flower beds requires less maintenance than large lawn areas because they do not require weekly mowing or extra watering. Loss of open space and wildlife habitat and dirty rainwater runoff are the leading causes of environmental degradation in our developed areas. If we can replace some of this lost habitat in our yards, then we can reduce some of the negative impacts of development and have cleaner water in our neighborhoods. There are numerous examples in our area where native landscaping is a resounding success. In fact, we know of hundreds of homes we have visited over the years that already provide natural area protection. The butterfly garden planted in front of The Conservation Foundation's office is an example of Conservation@Home. You can easily incorporate native plants into existing flower beds; just be sure to check the growing requirements and make sure they will get enough sun, shade or moisture as with any perennial plant. Native flower beds , however, do need to be weeded occasionally. Mulching with wood chips, generally available through your community for free, will help keep unwanted weed growth down. It is best to cut back certain plants to keep them from getting too large or taking over. They can either be mowed down or cut by hand after they have died back, although leaving some stalks and tall grasses adds a nice dimension to the winter landscape and provides seeds for birds. If you do not want your prairie flowers to spread to other parts of the yard, you can cut off the seed heads or pods and dispose of them before they ripen. Visit our Conservation@Home Guide to Professional Resources.